For over a decade, ignorant baseball fans pleaded that Pete Rose was innocent and never bet on baseball. They believed every word Charlie Hustle told them. Why did they believe him? He was their “hero”. They believed his hollow lies despite the mountain of evidence against him and the fact that, in leaving baseball, he signed a statement accepting his banishment as long as the commissioner did not unveil the evidence to the public. Then fourteen years after his banishment, Rose released My Prison Without Bars and admitted to betting on Cincinnati Reds games he managed. This seemed to hit his backers and fans like a punch to the stomach, but they just came up with new arguments to back up the all-time hits leader. Well, he didn’t bet against his team. So he tells us. Now we have come to the third phase of the Pete Rose saga. Many are now saying what Pete Rose did isn’t as bad as what the steroid users had been doing. Alex Rodriguez broke the rules just as much as Rose did, they say. If a steroid user can make the hall of fame, so should Rose, they say. They hurt the game just as much as Rose. I would never give Pete Rose a vote for the hall of fame. At the same time, I’ll be the first to admit that Rose was one of the greatest players of all time. No one played the game harder on the field and no one disrespected it more off. I would vote Barry Bonds and Rogers Clemens to the hall on the first ballot while admitting they took performance-enhancing drugs (PED). I hate to break it to the steroid-user haters out there, but there’s likely already a steroid-user in the hall already. Every major league clubhouse has the rule stated on the wall: Gambling will result in lifetime banishment. This includes association with gamblers and betting on games of which the player is not a participant. Rose looked at this rule from his rookie season of 1963 through his final season as manager with the Reds in 1989. After breaking records and accumulating millions of fans, Rose may have felt the rule didn’t apply to him or, because of his stature, he could slip by unnoticed. Rose broke baseball’s biggest rule when he bet on baseball. Today, it’s still baseball’s biggest rule. A report on a player betting on baseball would be a much bigger story than anyone using PED. A strong argument can be made to say using PED was encouraged for a time – it’s called 1998. Fans may not have consciously realized it, but baseball was promoting the use of steroids as the nation stopped, captivated by the heroics of Sammy Sosa and Mark McGwire and their quest to break the single-season home run record (https://tripleinthegap.wordpress.com/2010/01/31/the-real-single-season-home-run-record/). In 1998, the steroid snowball could be held by a small child, but it was developing. The nation had two lovable sluggers in a friendly competition for a 37-year-old record. Everyone turned a blind eye to the inhuman size of these men and the way they – even when they swung late at a 98-mph fastball – could flick a ball over the opposite-field fence. Steroid users were cute in 1998. They smiled for the cameras and brazed the covers of magazines. But by 2001, the snowball turned into an avalanche. It was then that two protagonists turned into one giant antagonist and fans started questioning the power surge. That’s when Barry Bonds showed everyone what the best player of his era could do on steroids. Mark McGwire and Sammy Sosa?, Bonds thought to himself. Pfft! They’re one-trick ponies. Watch this. Then Bonds broke their records. He broke them without the smile. Bud Selig and America didn’t like it: hence, strong anti-steroid rules. The same could be said for the amphetamine era; an era that last much longer than the steroid era. Unfortunately for Rose, if there was a gambling era, it ended at the 1919 World Series. In good ways and bad, Rose was one of a kind. After 1919, there hasn’t been a gambling era. There’s been no incentive to gamble on baseball, especially since the free-agency era with salaries at astronomical levels. Rose knows about 1919. He knows what happened to Joe Jackson after being convicted of gambling, one of the greatest players of his era – banned for life. Do the consequences need to be clearer? What did Barry Bonds and Roger Clemens see when their peers took illegal drugs to improve their game? National fame and further riches: that’s what they saw. Fans love to look down on steroid users because steroid users have the big records. They hit home runs. When are baseball fans going to grow up and realize the home run is overrated? Why aren’t more fans complaining about all the other statistics busting at the seams because of other PED? Amphetamines have been fueling baseball for decades and no one seems to care. No one cares even though now that they’ve been banned from the game and players actually seem to be aging. There has been a huge drop off of statistics for players over the age of 32 since the banishment of amphetamines and steroids. How many hits would Rose have had without the help of “greenies”? How long would his career have gone on? Dare I ask, how many home runs would Hank Aaron have hit? Why do we care about two records (single-season and all-time home runs) and none of the others? What about cocaine? Cocaine was a huge problem in the 1980s and no one is calling for Tim Raines’ stolen base numbers to be taken away. As long as players weren’t popping pills for the cameras or taking out their vile of cocaine at second base, it was easy to get away with these PED before baseball stepped in and banned them. Amphetamines and cocaine users don’t grow gigantic muscles and, more importantly, they don’t break home run records. Not only is there loads of evidence against Rose in regards to betting on baseball that the public has never seen (Rose, you can thank the graciousness of the late Bartlett Giamatti for that), but there’s also people out there who know about Rose’s use of amphetamines. But who cares about that? No one because amphetamines didn’t help Rose hit home runs (at least not a lot of them). In other words, Rose also used performance-enhancing drugs. Many of Rose’s backers, despite knowing he bet on baseball, feel he deserves a spot in the hall of fame based on his playing statistics and legacy. Some believe Bud Selig can wave his magic wand and suddenly Rose will be in Cooperstown. I’d be curious to see if the commissioner ever did allow Rose back into baseball what the voters would do. Many don’t realize that the baseball hall of fame isn’t a part of Major League Baseball. It is an institution on its own. It’s not up to MLB to let Rose in – it’s up to the voters. The voters can write Rose in now and there’s usually a few who do, but not enough to get him into the hall, let alone the five-percent needed to get a player on the next year’s ballot. Steroid users only wanted to improve their game and to keep up with the competition. They still wanted to win the World Series and beat their rivals. The goal of the game was still to win it. The reason there are rules against gambling is because it turns the game on its head and it becomes a show. Steroid users did alter the game, but their goal remained the same. Unless the evidence on Rose is released, we may never know what his intentions were. I don’t trust his opinion, I know that. We know Barry Bonds took PED and that he hit 762 home runs. Just because his name is on top of the home run list in the record books, doesn’t mean he has to be the home run king in your mind. Hank Aaron can still be your home run king just like how Rose can be in your hall of fame. Steroid users should get a vote, only with a much higher standard – the entire era included (non-steroid users). The public will never know all the answers to the steroid-era, just like we’ll never know who was using amphetamines, who was gambling on baseball, who corked their bats and who cheated on their wives. 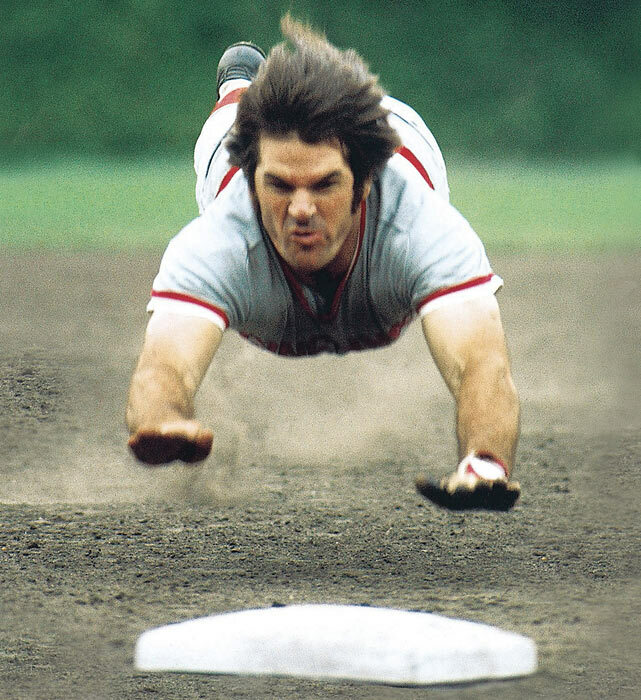 Pete Rose is one of the greatest players of all time and he doesn’t need the hall of fame to prove it. We know! Just because Bob Dylan didn’t win any Grammy’s in the sixties doesn’t mean we don’t know his music was revolutionary. Pete, you were one of the all-time greats. We know it. We won’t forget you. You just can’t come back to the ballpark with us. Note to Triple In the Gap readers: I have joined the Peace Corps and have been living in Thailand since January and will be here until around opening day, 2013. Living without baseball hasn’t been as difficult as I thought. The number one question I was asked from friends and family before I left was, “What are you going to do without baseball?” This made me wonder if people thought I was so shallow that all I thought about was baseball. No, I also enjoy good literature and films like Shoeless Joe and The Natural. Like all the other luxuries I enjoyed in the states (peanut butter, toilet paper, comfortable weather, libraries with English books) I don’t miss what I don’t have. If I was in the states and was barred from going to baseball games, then I’d miss it. But there’s no one here asking me if I saw the play that Denard Span made last night or what a great time they had at the Saints game, so I’m apathetic. However, I am getting small fixes now and then through the games I have saved on my computer and the computer game Baseball Mogul (I’m currently playing a full season as the Billy Martin-led Twins of 1969.) As for reading the news on the internet, I’m pretty satisfied simply checking the Twins box score and then the standings to see what team’s been hot lately (as of today, the Twins!). Now that the season’s in full swing, I keep getting the comment, “It’s a good thing you’re not here with how bad the Twins are.” I strongly disagree. No, I don’t want to go back just to see a Twins game, but I have honestly missed bad Twins teams over the last decade. We Twins fans have been spoiled. We are not Yankees fans – we do not need to go to the World Series to be satisfied with our team. We take what we get and I think the last decade has spoiled us to the point where they’re a little more like Yankees fans, but still light years away from their egotism. Last season was frustrating for me. For my entire life I could always count on going to the Metrodome by myself or a friend on game day and finding a seat to watch the greatest major league baseball organization in the history of Planet Earth. Last year, the fair-weather fans flocked to the brand new Target Field like it was a 1994 Garth Brooks concert. Twice I showed up by myself hoping to squeeze in somewhere – no go. Meanwhile, there were 40,000 people inside about to see the game and 5,000 of them would leave early because their short-attention spanned kids consumed too much cotton candy and Mountain Dew and wouldn’t stop crying for two innings while witnessing one pitch through six innings … the first one. I’ve watched some of the best baseball of my life when the Twins were “bad” (https://tripleinthegap.wordpress.com/2010/06/06/best-of-the-best-greatest-games-attended-6-10/).This year, 2011, the novelty of Target Field has worn off and the Twins are horrible with their number one draw, Joe Mauer, on the bench with owwy legs. I think I’d be able to get a seat on game day now. I don’t care if the team’s bad. One of my favorite Twins teams was from 1996 with Paul Molitor and Chuck Knoblauch leading off the lineup with matching .341 batting averages (Molitor’s was slightly higher) and a pitching staff that couldn’t strike out Babe Ruth (present day). If there’s something I miss most about baseball at this point, it’s that everyone at the games speak English. I miss it, but in the same way I miss my friends, family and book stores – it’s what I signed up for and I was prepared for that sacrifice. As for the 2011 Twins, I don’t care how bad the team is, I just want to be able to see them without having to buy a ticket four months in advance.